The Marshall Road Safe Routes to School (SRTS) program is committed to helping provide our children with safe walking routes to school by working with the Town of Vienna on current and future sidewalk projects, as well as supporting other local elementary school’s SRTS programs and efforts. SRTS sponsors a number of programs during the school year including Walk to School Week. SRTS also works with the school on matters of student safety regarding school grounds and roadways near the school. The Safe Routes to School program is excited to kick off our regular Walking Wednesday events starting in September. On the first Wednesday of each month, we encourage our students to walk to school. Each time they participate, they will receive a “toe token” that they can hang on their backpack. Walking Wednesdays are held rain or shine, so stop by for your token every month! Our Walking Wednesdays for the 2018-19 school year will be held on September 5, October 3, October 10 (Walk to School Day), November 7, December 5, January 9, February 6, March 6, April 3, May 1, June 5. Volunteers are needed to help distribute toe tokens. Sign up HERE. Our Bike Train will run more rarely this year. 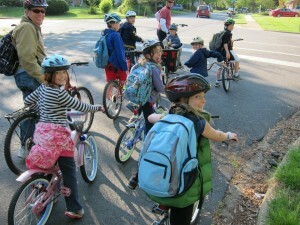 The only confirmed dates are May 8 (Bike to School Day) and during the annual Vienna Bike/Walk Challenge (May 6-10). For more information on SRTS or to volunteer to help staff the Walking Wednesday table, contact Brian Dauernheim at saferoutes@marshallroadpta.org.